JANE: A couple of weeks ago, it sure seemed like Jim and I, and you and Robin managed to catch a variation of the same “bug.” As I recall, you even got hit while you were away from your home base. ALAN: Curse these internet viruses! Now that we’re all better, I’d like to ask a few questions about how you get medical treatment there. JANE: Now, this time I wasn’t ill enough to need to go to the doctor. However, I did get some “over the counter” remedies for the aches, pains, and coughing. I was wondering, in a country with socialized medicine, do you get those for free? ALAN: No, not at all. Most prescription medications are subsidised to some extent, but over the counter remedies simply come under the heading of “things that you buy in a shop” and they aren’t subsidised in any way. JANE: Now, if I had been sick enough to need a doctor, I first would have needed to call and make an appointment – or hope that one of the clinics that takes my particular insurance could take me as a “walk-in.” Does it work the same there? ALAN: Pretty much, yes. I am registered with a local GP (general practitioner) and my primary health care records live with him. He’d be the person I’d arrange an appointment with in the first instance. In an emergency, I’d go straight to hospital, of course. There’s also a twenty-four hour phone service called “Healthline” where you can ring and talk to a registered nurse. You usually go into a telephone queue of course, but eventually you get a human being. We rang it a few months ago when Robin mis-read the instructions on some anti-inflammatory pills and took a few too many. The nurse couldn’t help directly, but she transferred our call to the Poisons Centre (whatever that is) and they were very helpful. It turned out that she hadn’t taken enough to be in any danger, but they told us what symptoms to watch out for, just in case. There are also privately run clinics which work on a first come, first served walk-in basis. But they tend to be measures of last resort because they can be quite costly. JANE: I like the idea of a “Healthline.” I wonder if we have anything like that? I should check. We do have a Poisons Hotline where you can call if you think you might have poisoned yourself. I just tried a test – my allergies have been bothering me something awful. When I called, I found I could get an appointment with my specific “health provider” as early as tomorrow. I admit, that was better luck than I anticipated. I’d thought I might need to take first come, first serve, rather than seeing someone who knows me. How long is the usual wait there? ALAN: I can almost always get an appointment to see my GP within a day or two. If I’m really lucky (and call early enough to miss the rush), I might even get an appointment the same day. JANE: Now, in my example above, I wasn’t looking to see a specialist of any sort. Sometimes the wait for those can be a lot longer – and I expect the wait varies according to how severe the problem and how “in-demand” the specialist. Earlier this year, Jim decided to see an eye, ear, nose, and throat specialist about some sinus problems he had. He had to wait three weeks for an appointment. However, when he decided to have corrective surgery, that was scheduled with surprising promptness. He did need to wait for the actual surgery, but that was because he had to stop taking certain blood-thinning medications and vitamins in advance. Here in the U.S. we hear horror stories about people in countries with socialized medicine being kept waiting for months, even years for treatment. Does that match your experience? ALAN: Actually, I’d expect pretty much the same sort of waiting time that Jim experienced. There are long waiting lists in the public health system for some popular non-urgent elective surgeries (hernia repairs and the like), but you seldom have to wait very long for anything important. Most specialists also accept private patients, and if you (or your medical insurance) can afford it, you can bypass the queues that way. I had my vasectomy done privately and Robin had an operation to tighten her droopy eyelids done privately as well. Your answers have, as usual, raised some more questions for me. Let’s continue this next time! This entry was posted on September 13, 2012 at 1:00 am and is filed under Thursday Tangents. You can follow any responses to this entry through the RSS 2.0 feed. You can leave a response, or trackback from your own site. I was thinking much the same thing. Of course, AFAICT ‘socialised’ simply means ‘the government is involved somehow’ to the average American; with no real awareness of the range of practice that actually exists. [for the record, procedures, methods and ownership of resources are very different in the ‘socialised’ systems of Canada, France, the UK and New Zealand] The ironic thing is that from what I’ve seen, neither system is better, or even all that good, at allocating resources or controlling costs. What they do seem to do is engender very different attitudes on the part of providers. To illustrate: there’s a steady stream of physicians heading south of the border in search of fame and fortune – although most are happy to settle for fortune, disgusted by government interference in their live and practices. There’s an equally steady stream headed north, many returning but many American-born as well, disgusted by an over-riding focus on the bottom line rather than patient care. Both attitudes are the extremes of their respective ranges, of course, but in the time I spent in the medical-systems business I learned there’s a pretty clear pattern in what weight they receive where. What I always wonder is why my health insurance, which is from a good company, doesn’t always cover my required preventative health care, like my annual mammogram. What does the mammogram really cost? And could I get one for less if I didn’t live on the East Coast of the United States? Maybe one costs less in Iowa, for example. 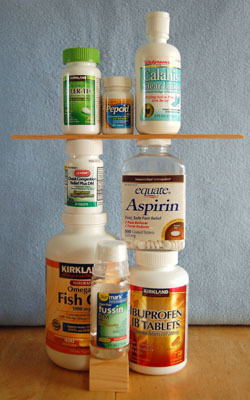 And, from the picture, does Jane take both Aspirin and Ibuprofen? Interesting about the mammogram… My annual is covered in full. So is my basic “wellness” check-up each year. Although there is the interesting caveat that if I bring up a problem, they may bill my co-pay as if I went in with a problem. Very weird. No. I don’t take both aspirin and ibuprofen. I take aspirin. Jim takes ibuprofen. Aspirin does nothing for me. I might as well eat sugar. (And sugar would be more fun.) Jim prefers ibuprofen. Our doc says being aware that medicine is not a “one remedy fits all” thing is an important part of responsible personal care. I’d point out one of the deep ironies in American health care is that people like hospital pharmacists have no idea what their treatments will cost the patient. The cost gets settled later, when the hospital negotiates with the insurance provider. If nothing else, I would like to see the US get to the point where there was one cost per service (or drug, or whatever). Certainly discounts can be negotiated, but right now, there’s a strong incentive in our system for both health care providers and insurers to play games with the cost of health care, and I’m not sure it really aids anyone to do so. Heteromeles, I agree. We’re potentially facing orthodontic work for our 10 year old. One of the providers couldn’t even give us an ESTIMATE until we were able to let her know our insurance company. She said each insurance company pays differently. My question was, “Why?” It’s the same number of hours, the same treatment, the same metal work or ceramic or plastic… Why isn’t there a standard cost? Ann, so far as I understand it, there seem to be two reasons why there aren’t standard costs. One issue is simply that we’re not the customers in American health care, unless we’re uninsured. The customers are our insurance companies, and we’re effectively the services rendered. If we’re uninsured, we bear the full cost,. The insurance companies negotiate discounts, based on their customer volume and such. The other issue is that one person’s systemic inefficiency is another person’s career. Because there are so many different providers negotiating all these costs, there’s a large health care industry to deal with this complex mess. If there was national health care (in other words, the government was the sole customer), then many people in the insurance and health care industries would lose their jobs. Aside from the government not wanting to drive up unemployment, I believe that a lot of the insurance jobs are located in northern Ohio, which is the democratic part of that critical swing state. Putting a lot of democratic Ohio voters out of work, no matter how good the cause, is not something our current President wants to do, and for ideological reasons, the Republicans don’t want to do it either. Sorry for the intrusion of politics, Jane. I could be wrong about Ohio, but I was impressed by the number of insurance companies I saw while I lived there.